Have you ever walked a goat, been an X-factor judge at a sheep show or groomed a pony? The William Scott Abbott Trust at Sacrewell invites you to 50 Days of Summer where you can enjoy brand new experiences in the countryside air and sunshine. Race around the Sacrewell Farm Olympics Obstacle course or turn your hand to welly wanging and seed bombs. Have a go at building a wildlife hide or race your duck down the mill stream under pooh sticks bridge. Get outdoors and create unforgettable memories in our beautiful Cambridgeshire farm this summer. Please note that activities are subject to change without notice so please check with the reception team on arrival. 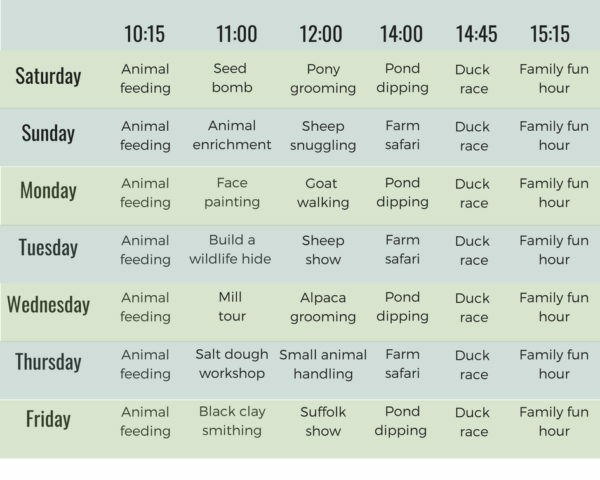 Some activities are chargeable including tractor rides (£1.50) and duck race (50p).